We invite you to explore India - the Land with infinite beauty ! Whether you soar high into Himalayas or peer under the ruins of the Ancient monuments dotting the landscape of India, you will cherish the experience long after your visit ! This India Travel Guide on Sabarimala Temple is free from any commercial interest! This site is dedicated to promote India - the vast subcontinent, its glorious past, magnificent landscape and its infinite variety. 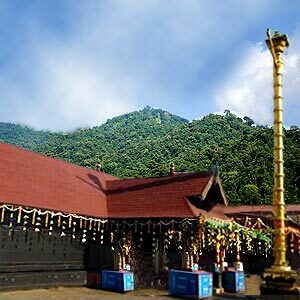 Sabarimala or Mount Sabari which is about 3000 feet above sea level in the Sahyadri mountain ranges in the Western Ghats of Kerala is perhaps the best known pilgrimage destination in this land of temples and elephants. Sabarimala is at the northeast of Pathanamthitta, which is in the midst of the forest stretching all the way to neighbouring Tamil Nadu. And Sabarimala Sri Dharmasastha Temple is the most famous and prominent of the Sastha temples. The main deity Lord Ayyappa is an embodiment of Lord Siva and Lord Vishnu. There is a small Darga dedicated to Vavar, a Muslim saint who was supposed to have been the lieutenant of Ayyappa. Legend has it that it was Parasurama Maharishi who installed this idol of Ayyappa at Sabarimala, after retrieving Kerala by throwing his axe into the sea. According to Hindu mythology, Sabarimala is the place where Ayyappa meditated after killing the demon. Lord Ayyappa temple is situated amidst 18 hills. It is believed that pilgrimage to this temple is synonymous with journey to heaven. It is estimated that the largest annual pilgrimage in the world of 40 -50 million devotees throng this temple every year. There are several austerities for the discerning pilgrims to observe before visiting this temple. They are required to follow a vratham - penance for 41 days. They wear rudraksha or tulsi beads and have to trek the hills and dales to reach this temple. One admirable feature of Sabarimala is that it is open to all, irrespective of caste, creed or religion or social status. The pilgrims have to undergo a fast not just to cleanse their body but also to cleanse their mind. The pilgrim does not indulge in any carnal pleasures and abstains from non-vegetarian food. They should not consume alcohol and tobacco. They should be careful not to use foul language and refrain from cutting their hair or shaving. Pilgrims should visit the local temples regularly and only wear plain black or saffron coloured traditional clothing. Sabarimala is open to males and females past menopause. However, little girls below 10 years of age can visit the temple. This is primarily because Lord Ayyappa is a chaste yogi and bramachari. While the male pilgrims are called Ayyappan, female pilgrims are called Malikappuram. The male carries the holy ghee for the abisheka of the Lord Ayyappa and coconut in irumudi. It is customary for pilgrims to set out in a group under a leader. They carry the cloth bundle called irumudi kettu containing traditional offerings. This temple is open only during specific periods of the year - from mid November to mid January and only for the first five days of every Malayalam month. Pilgrims throng this temple not just from South India but from across the globe. The temple is open from November to January for the pilgrimage season. There are two prominent poojas at Sabarimala. One is the Mandala Pooja in the month of November and the other is Makara Vilakku (Makara Jyothi) during January. The temple remains closed during the rest of the year and opens during Vishu in April. The high point of the pilgrimage season is Makara Jyothi, when the light appears in the mountain range called Ponnambalamedu facing the temple. The light is supposed to bring good fortune in the lives of the spectators. Aravana payasam and Appam are quite famous at Sabarimala as prasadams. These are prepared with rice, ghee and sugar. At the Sabarimala, rice for the prasadams comes from the Chettikulangara Devi Temple at Mavelikkara. The Pamba River is the main halting point on the way to Sabarimala. The easy route is through Chalakkayam by which one can reach the banks of the river Pamba. One has to trek about 4 -5 kms from here to reach the temple. Many devotees prefer the traditional mountainous forest path which is approximately 45 kms to Azhutha River to reach Kariyilam thodu. From here, they go to Cheriyanavattom, Valiyanavattom before reaching the Pamba River. Aranmula kottram is one of the halt places. Nowadays vehicular traffic is allowed till the Holy Pamba River by an alternate road. Thereafter is the mountainous forest trek for 4 kms up to the steep hill Neeli Mala to Sabarimala.